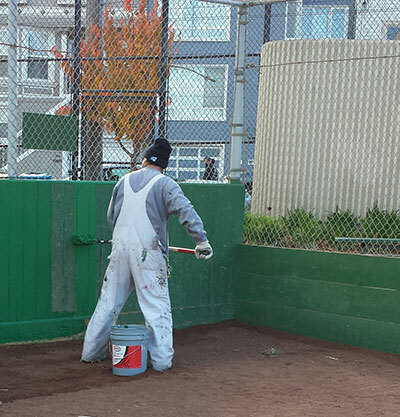 The backstop and bleachers get a bright new coat of paint while gardeners freshen up the flower beds. Improvements have been visible lately. Park personnel have been sprucing up the place inside and out. As the new year begins, we want to extend our appreciation to Rec & Park employees for all that they do. On the agenda for the coming year are more community events and concerts. In process is an Open House in May showcasing local history, including an interactive timeline in which neighbors will share their neighborhood experiences. We also hope to make new friends as we work together to tackle issues together in 2014. Cooperation and volunteerism will be the key. 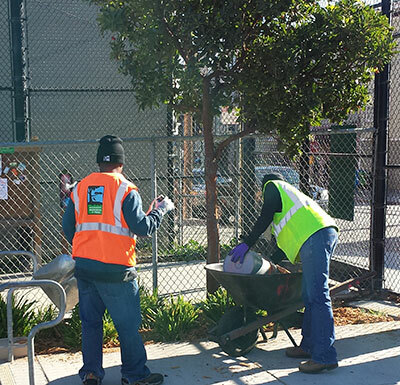 To that point, Friends of the Noe Valley Recreation Center will be redoubling the effort to invite parental participation in the discussions that affect the park and that drive decisions about programming and events. The Community Recreation Council is integral to the Friends network. Meetings are once a month. (Check the calendar for dates.) Everyone is welcome. The Winter program begins January 7. Space is still available for many classes. Girls Basketball and Racquet class (ages 8 to 9 Thursdays, ages 10 to 12 Saturdays), Drop-in Volleyball, and Women’s Futsal are all still open. See the full list of Winter classes at Upper Noe here. 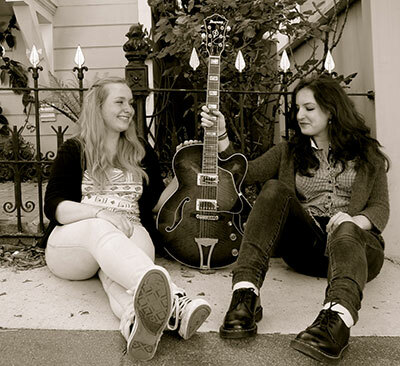 Saturday, January 18 from 10 to noon – The Knickerbockers blues band will entertain on the playground. Always a hit with children, they will delight parents as well. Rain moves the show into the auditorium. Walter and Joan tackle the trumpet vines. 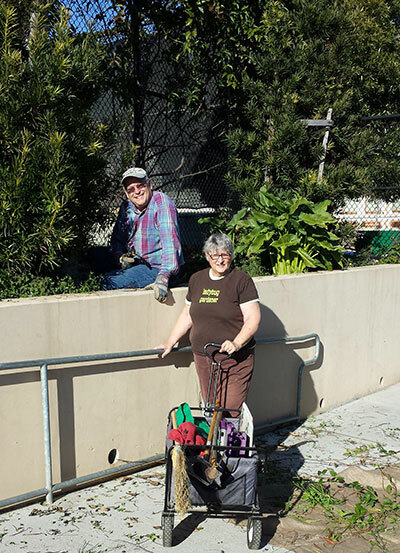 Joan Lionberger and company exercised their green thumbs on Saturday, December 14, pruning the trumpet vines on the tennis court fence, weeding flowerbeds, and generally making the place look nice. The weather was lovely and a good time was had by all. Volunteers are always appreciated. Facilities Coordinator Cheryl Woltjen recently had a decorative touch added to the courtyard. Workers just installed the lovely, hand-painted tiles that children produced during the September Cinco de Noe celebration. These are the product of a fund-raising project created by Friend’s Kim Nguyen-Ehrenreich. Parents made a donation for each 5 x 5 ceramic tile and the children used water-based materials to hand-paint their own designs upon them. Then Kim had them professionally fired. Cheryl says the installation was easy and there is plenty of room for tiles to be added, too. Seeking new benches. 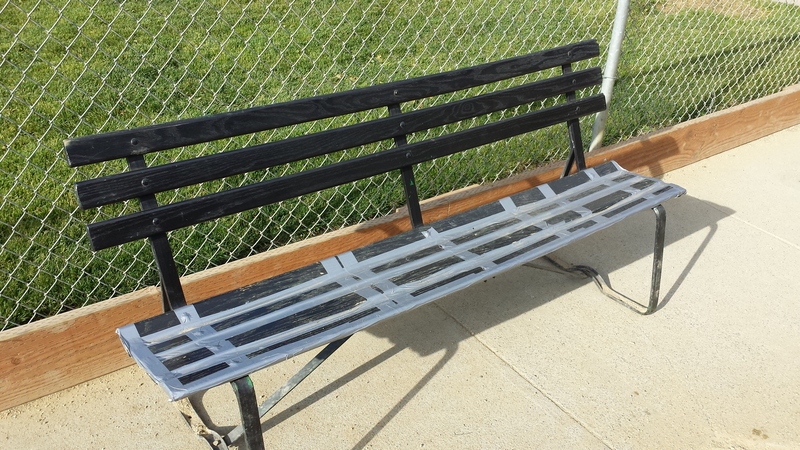 While the exterior furniture in the rest of the park is getting shined up, benches in the dog run are looking sad. Neighbors are keeping them patched together but that is only a short-term solution. Replacements are on the wish list for 2014. Warriors arena on the Waterfront? Former Mayor Art Agnos will discuss. San Francisco Village--This city-wide network helps older adults stay in their homes and neighborhoods and live active, full lives.